This is one of the best cleansing oils in the market! It can remove even the strongest waterproof and long lasting make up! Suitable for any skin type. The "advanced formula" was derived from the original "classic" formula. I love the original one already, so I got the new one too!! Cleansing oils are usually for people with normal or oily skin. Those with dry skin are better off with cleansing milk or cleansing cream. Some cleansing oils are more runny, whereas others are thicker in texture. I like to use the thicker cleansing oils, cause it can stay on my face longer without running everywhere. Most cleansing oils can at least remove your face make up, such as foundation, blush, highlights. 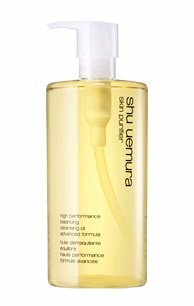 Some stronger ones like the Shu Uemura cleansing oils can also remove eye and lip make up. Pump 2-4 times on dry hands. Begin massaging the oil into your face. This will remove make up, dirt and other impurities. Using slow and firm motions massage the oil deeply into your pores. Take time and focus on problem areas (such as your T-zone and chin). You want the oil to dissolve all your blackheads. Add a few drops of warm water to face to emulsify (oil will turn milky white). What I like about this one is that it's super clean and takes off make up fast!! You don't need to follow up with another foamy cleanser, cause it does a really good job cleansing by itself. But if you want, you can still use a foamy cleanser to feel more clean.